60 Rayovac Extra Mercury Free Batteries, Size 13 Zinc Air Hearing Aid Batteries. (60 batteries Standard dial pack, 10 cards of 6 cells each). 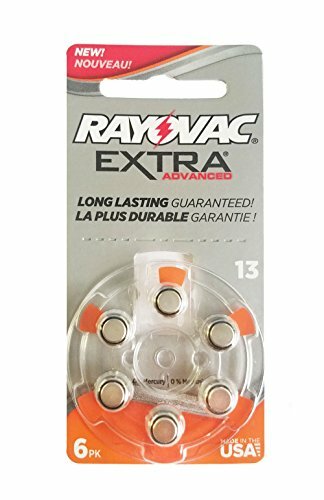 Rayovac Hearing Aid Batteries, are the best selling brand and they claim to have the world's longest lasting hearing aid batteries. Experience the world's longest lasting mercury-free hearing aid batteries - Rayovac Mercury Free, The Green Choice. Delivering 30% more battery life than other mercury-free hearing aid batteries, Rayovac Mercury Free offers consistent power and performance with an environmental focus. If you have any questions about this product by Rayovac, contact us by completing and submitting the form below. If you are looking for a specif part number, please include it with your message.